Ahmedabad, July 28 (IANS) The Congress was on Friday jolted by the exit of six of its legislators in 24 hours, with one more likely to leave, even as it accused BJP President Amit Shah of engineering defections in Gujarat by “money and muscle power”. Late in the evening, the party was bracing to fly off its Gujarat MLAs to Bengaluru. Party sources claimed that in a last-ditch attempt to prevent any more legislators from resigning and defecting to the BJP in view of the August 8 Rajya Sabha elections where veteran leader and Congress chief Sonia Gandhi’s Political Secretary Ahmed Patel is contesting from Gujarat, it was imperative to keep the rest of the flock aloof from allurements. The Congress legislators are reportedly to be bundled out later on Friday night on an Indigo flight to Bengaluru. Three MLAs, Balwantsinh Rajput, Tejashree Patel and P.I. 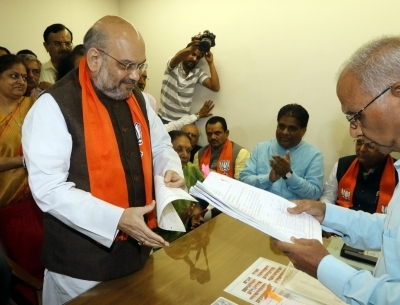 Patel, quit on Thursday and joined the BJP, while three more submitted their resignations to Speaker Ramanlal Vora on Friday but did not join the BJP till evening. Those who resigned on Friday are veteran Congress legislator Ramsinh Parmar, MLA from Thasra constituency and chairman of the prestigious Amul Dairy, Chhanabhai Chaudhary, MLA from Vansda constituency, and Mansinh Chauhan from Balasinor. Congress Chief Whip Balwantsinh Rajput, MLA from Siddhpur who quit on Thursday, is rebel leader Shankersinh Vaghela’s close relative. Rajput, within minutes of joining the BJP, was named for the third Rajya Sabha seat for which Patel has filed his nomination. BJP president Amit Shah and Union Minister Smriti Irani are the other two party candidates. One more Congress MLA, C.K. Raolji, who is believed to be the closest to Vaghela, was on his way to resign, but turned back midway “for final negotiations” with the BJP, a close confidante of Raolji told IANS. “Till evening, everyone thought that he quietly went to the Speaker’s official residence and resigned, but he is yet to do so. Some final negotiations (with the BJP) are going on. Of course, eventually, he will resign,” the source said. Local Gujarati TV channels and the rest of the media assumed that Raolji had quit and had proclaimed so, leading to confusion, he said. AICC media in-charge Randeep Singh Surjewala rushed here from New Delhi. The issue also rocked the Rajya Sabha, which witnessed repeated adjournments as angry Congress members accused the BJP of “stealing” party lawmakers. It was alleged that Scheduled Tribe Congress MLA Punabhai Gamit, a three-time legislator, was being threatened and lured. “He was forcibly detained and an attempt was made to give a bribe of Rs 10 crore with allurement to meet Amit Shah,” according to the statement, which also has Gamit as a signatory. “Similar attempts to buy the loyalty of Congress MLAs Mangalbhai Gavit and Ishwarbhai Patel were made by misuse of muscle power, money power and state power. “It is the innate belief of these MLAs in Congress ideology and their impeccable integrity that deterred the conspirators and resulted in an absolute failure of their conspiracy to cause defections through allurements,” the Congress said. 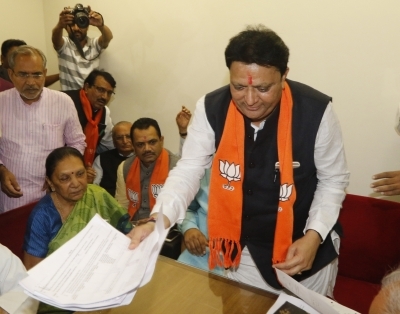 Besides Surjewala and senior Gujarat leader and Congress MLA from Abdasa Shaktisinh Gohil, the statement has been signed by legislators Punabhai Gamit, Mangalbhai Gavit, Ishwarbhai Patel and Anand Chaudhary.